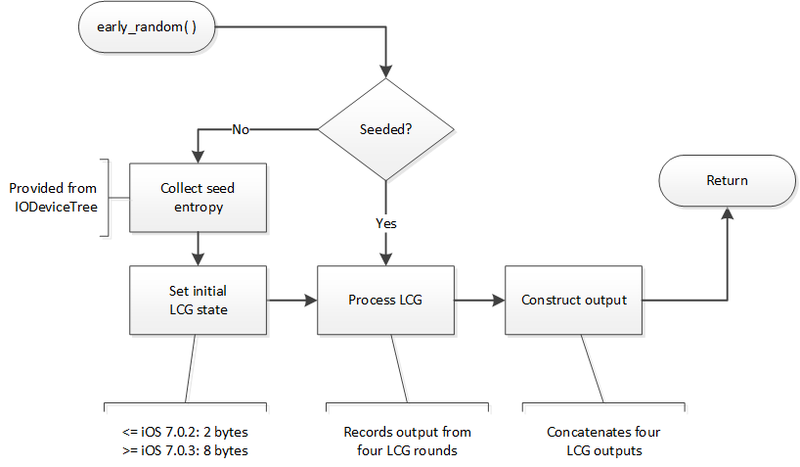 An LCG's quality is essentially determined by its choice of parameters. Although the early random PRNG is clearly inspired by glibc random_r() and ANSI C rand(), it is alarmingly weak in practice. Notably, early_random() in iOS 7 can only produce 2^19 unique outputs, with a maximum period of 2^17 (length of sequence of unique outputs, before it starts over). This is well below the size of the possible output space (64-bits), and may allow an attacker to predict values with very little effort. In particular, we found that an unprivileged attacker, even when confined by the most restrictive sandbox, can recover arbitrary outputs from the generator and consequently bypass all the exploit mitigations that rely on the early random PRNG. These findings have been detailed in the following slides and white paper, and includes suggestions on how to improve early_random() in future iOS versions.